For the second straight season, the Huskers, ranked No. 2 in the preseason poll, dropped their season-opener in four sets, this time against No. 7 Florida. Errors doomed the Huskers on Friday night as the Gators took the match 25-20, 25-22, 23-25 and 25-23 in front of a crowd of 8,435 at the Devaney Center. Nebraska hit .126 for the match with 30 attack errors and 13 service errors. “We were too high-error, and that was one of my worries was being too high-error, Coach John Cook said. “Part of that was our ball-handling and passing wasn’t superb like it needs to be and we had a hard time getting into a rhythm offensively. 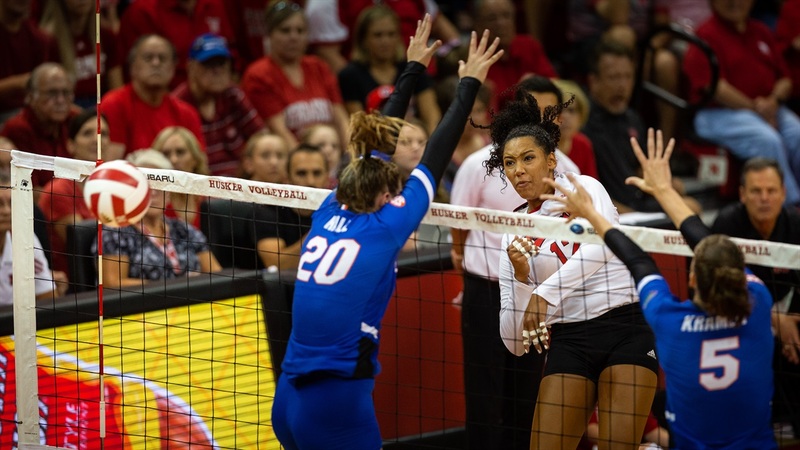 The Huskers had several chances to take control of sets but struggled to string together points to build runs all night long thanks to the miscues. Sophomore middle blocker Lauren Stivrins converted on the slide a handful of times throughout the night, but sophomore right side hitter Jazz Sweet was the only attacker for Nebraska that really found a rhythm. She finished with a team-high 13 kills on .273 hitting. Sweet really turned it on in the last two sets, converting nine kills and hitting .333 after getting off to a slow start in the first two. Senior outside hitter Mikaela Foecke had a double-double with 11 kills and 10 digs but only hit .085. Senior Libero Kenzie Maloney had 14 digs and freshman Nicklin Hames finished with 35 assists, 19 digs, three blocks, two kills and two aces. The match was a bit of a mixed bag for Nebraska’s new setter in her first collegiate match. Despite the loss, the Huskers aren’t hanging their hands after the rough showing. Nebraska jumped out to a 2-0 lead after an ace by Hames, but that proved to be Nebraska’s biggest lead of the set. After a handful of ties, Florida used a 4-1 run to take a 12-9 lead. Nebraska scored the next two points including a solo stuff by Schwarzenbach to pull within one but Florida took a 3-0 run into the media timeout. Nebraska pulled within two but a 4-1 Gator run made it 21-16 and Florida cruised to a five-point set one win. Florida out-hit the Huskers .242 to .179 in the first. Foecke and Sweet combined for five kills and 16 swings without an error but the rest of the Huskers had as many miscues as kills. Nebraska took an 8-6 lead in the second set after a solo block and a kill by Schwarzenbach but Florida responded with a 6-0 run. Nebraska snapped the streak with a double-block by the freshman duo of Schwarzenbach and Hames. Nebraska battled back to tie the match at 15-15, 16-16, 17-17 and 21-21 but could never get back in front. Florida closed out the set on a 4-1 run. The Huskers committed more errors (11) than they converted kills (10) in the second set, but Florida wasn’t much better with nine kills and nine errors. Florida took a 7-5 lead early in the third set and Cook made a change, subbing in freshman Capri Davis for sophomore Sami Slaughter at the second outside hitter spot and Nebraska responded with a 4-1 run capped by Davis’ first kill as a Husker. The teams traded points until a 4-0 run by the Gators put Florida up 15-12 at the media timeout. Nebraska chipped away at the lead until a 3-0 run gave the Huskers a 20-19 lead. The teams traded points until a 23-all tie and a kill by Stivrins on the slide gave the Huskers their first set point of the match. After a timeout by Florida, Miller stepped up to the service line and delivered an ace to extend the match. The third set included 14 ties and six lead changes. Florida out-hit Nebraska .158 to .128 and out-blocked the Huskers three to one, but Nebraska served up two more aces including Miller’s game winner and ripped off nine more attacks, leading to five more kills. Florida took a 12-8 lead with a 5-1 run early in the fourth set but Nebraska responded with a 3-0 run of its own. The Gators stretched the lead back out to five at 21-16 but Nebraska closed the gap once again with a 4-0 run led by Sweet with two kills and a block. Nebraska had two chances to tie the match, but back-to-back service errors allowed the Gators to hold onto the lead. A couple of errants serves by the Gators gave Nebraska a little life but it wasn’t enough as Florida finished it off with freshman Thayer Hall’s match-high 20th kill. Senior setter Brooke Smith was in street clothes for the match and Cook shared the reason afterward. Nebraska will have a chance to bounce back on Saturday night against No. 18 Oregon which dropped a 3-1 decision to No. 3 Texas on Friday afternoon. Junior opposite hitter Willow Johnson led the Ducks with a match-high 17 kills on .517 hitting. The Ducks beat the Huskers in four sets in last year’s VERT Challenge.